Whether your family loves a hearty breakfast to start the day or a filling breakfast-for-dinner, this steak and egg hash recipe should be the next dish you give a try! The smoky steak, deliciously runny eggs, and soft potatoes are all the flavors of great breakfast food. The spices bring out the unique characteristics of each part of the hash for a delicious bite, followed by another scrumptious bite, and then another. Your whole family will go crazy over this recipe. Once you make it, be ready to prepare it again soon! It’s a delicious, filling dish that will leave everyone feeling full and content once they’ve eaten their fill. Try making a homemade steak and egg hash by following our recipe below! Heat the olive oil and butter over medium-high heat in a large skillet until the oil shimmers, and the butter is melted. Add half steak and season it with salt and black pepper. Stir it to coat the pieces evenly. Cook for about three minutes, turning once the pieces have browned and have a slight crust. Once the steak is done, remove it from the skillet using a slotted spoon. Repeat for the rest of the steak, removing the cooked steak but leaving the juice. Add the potatoes to the skillet and season them with salt and black pepper. Make the potatoes into a single layer in the bottom of the pan and reduce the heat to medium. Cook about five minutes, turning once, until the potatoes are golden brown. Put the onions in the skillet with the potatoes and saute until the onions are tender and the potatoes are browned on all sides and can be easily pierced with a fork. Add the steak back into the skillet. Season the skillet with the salt, black pepper, paprika, garlic powder, coriander, and red pepper flakes. Stir until the spices evenly coat the onions, steak, and potatoes. Create four indents in the hash, then crack one egg into each hole. Season each egg with additional salt and black pepper. Cover the pan and cook until the egg whites are set but the yolks are still slightly runny. Top with diced green pepper and tomatoes, if desired. Serve. 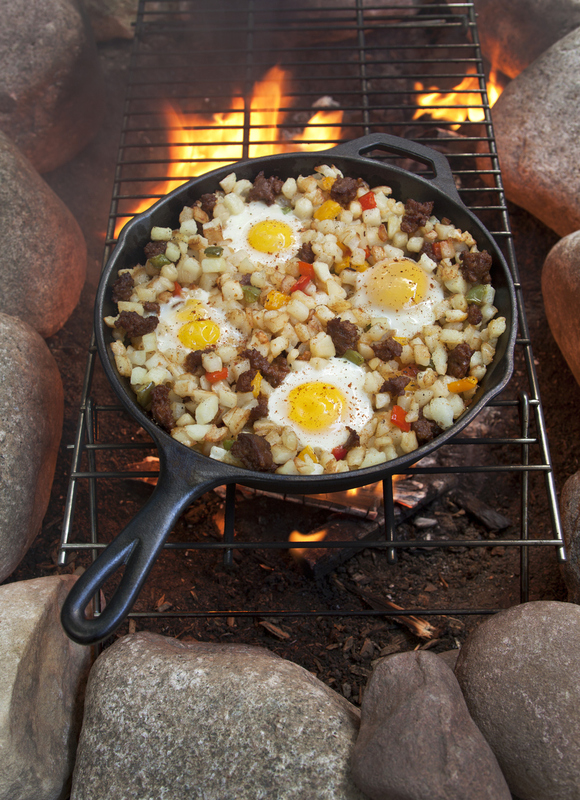 Using Sauder Eggs makes this steak and eggs hash recipe even better. We know our eggs are the best around because we work with dedicated farmers who care about quality as much as we do. To find your nearest store with Sauder Eggs in stock, make sure you use our store locator today.